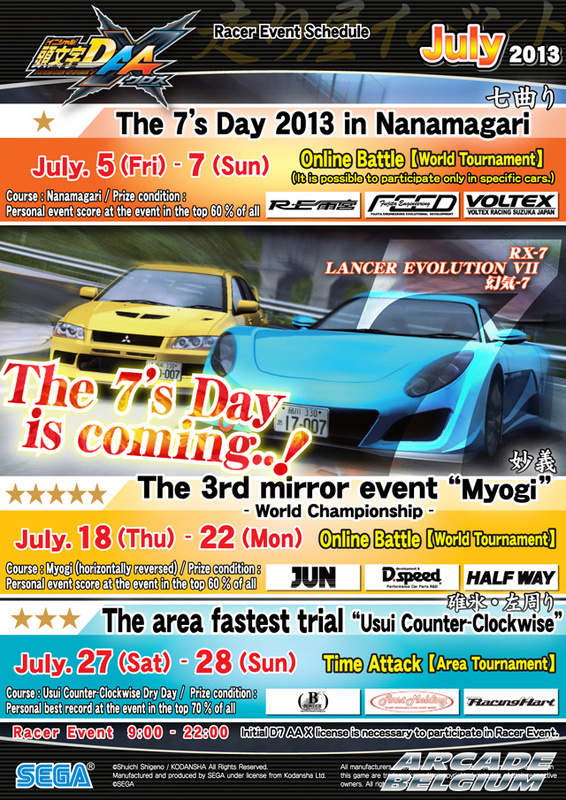 Sega announces Initial D Arcade Stage 7 AA X.
Sega annonce Initial D Arcade Stage 7 AA X. - "Project Kanto's fastest" story mode. Story mode can be played in tag teams of two. - Popular ID3 course "Tsuchizaka" is back! - New "cross emblem" system. - "Project: le plus rapide du Kanto". Le mode histoire peut être joué en équipe de 2. 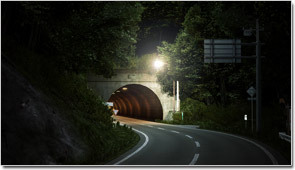 - Le stage de Tsuchizaka d'Initial D 3 est de retour! - Système de sorting boost. - Nouveau système de "cross emblem". - Nouvelles règles pour le multijoueur. Je trouvais déjà les autres magnifique j'ai hâte de voir cette nouvelle mouture . 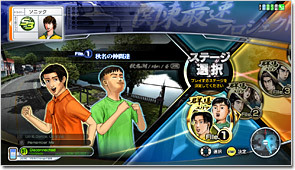 Initial D Arcade Stage 7 AA X will have Tag Battle mode for 2 human players, for 2 vs 2 races. There will be 43 vehicles and 14 courses available. 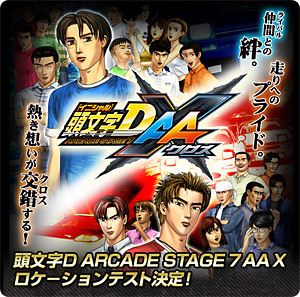 Initial D Arcade Stage 7 AA X proposera un mode Tag Battle 2 joueurs pour les courses en 2 contre 2. Il y aura 43 voitures et 14 parcours disponibles. Sega schedules a release for 2012 but no date has yet been revealed. Sega prévoit une sortie pour 2012 mais aucune date n'a encore été diffusée. Initial D Arcade Stage 7 AA X will be out on November 28th. 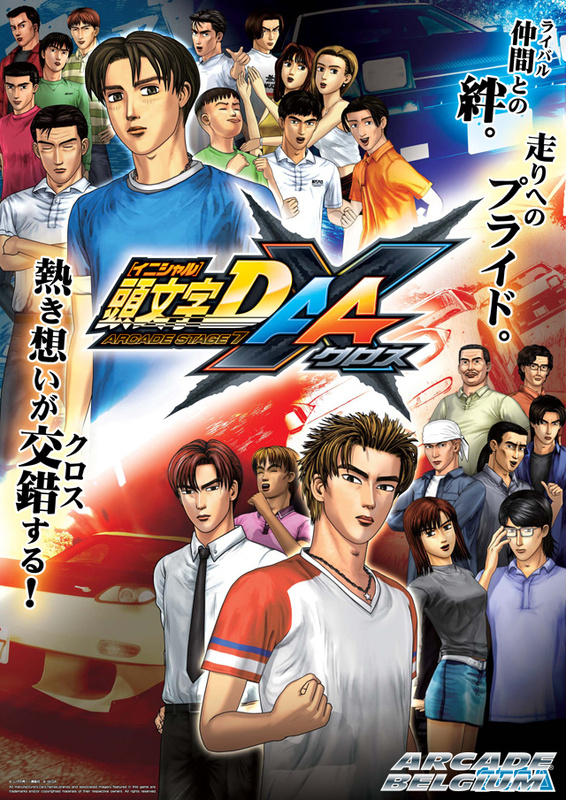 Initial D Arcade Stage 7 AA X sortira le 28 novembre. 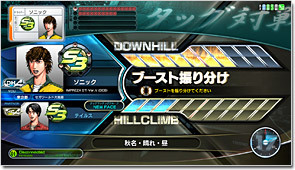 Great news for GACKT and Initial D fans: GACKT's song JOUNETSU NO INAZUMA will be a selectable song in the game (by pressing the blue button on the cabinet's right, music selection can be performed in the lower-left corner of the screen). Super nouvelle pour les fans de GACKT et d'Initial D : la chanson JOUNETSU NO INAZUMA de GACKT fera partie des musiques sélectionnables dans le jeu (en appuyant sur le bouton bleu sur la droite de la borne, un menu de sélection apparait dans le coin inférieur gauche de l'écran). Initial D7 AA X event starts! For the drivers who combine speed and beauty! Show spirit!! Holding the opening special event!! 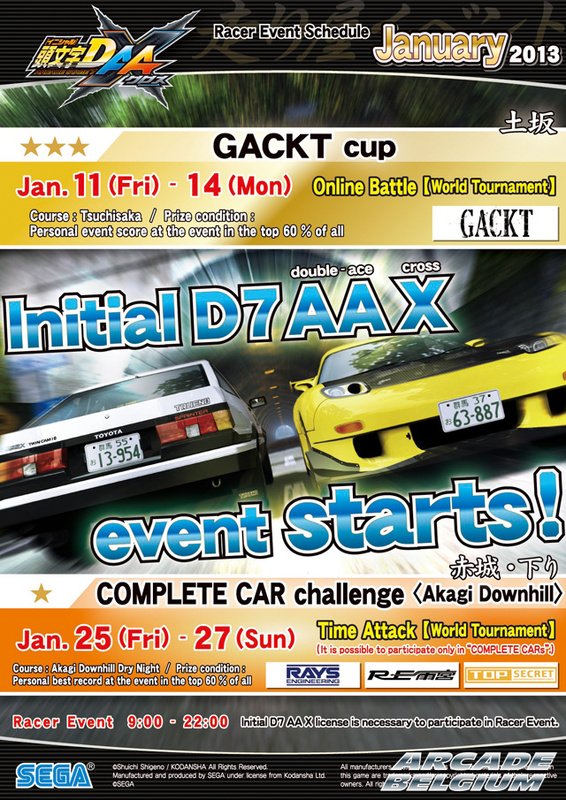 The 1st event of Initial D7 is………GACKT cup!! Who conquer the opening event with the super rare GACKT seal!? 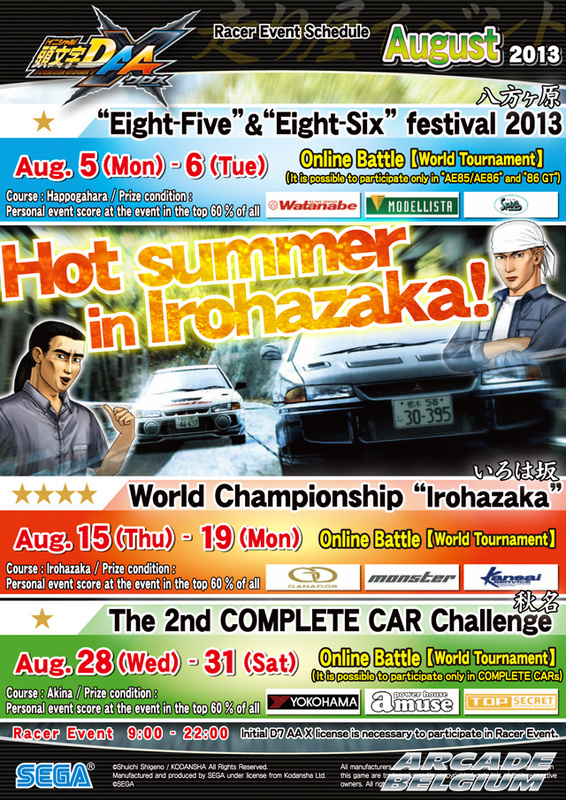 Holding Complete Car event only for Initial D7 AA X!! Drive a legendary fighter and account the fastest record!! Racer Event in February is decided! Run through the hill with heat! "Who is the fastest in Irohazaka?" It will be decided in this event!! All the results of the usual driving are for this event!! A racer's traditional event deed in Feb.14 is a BATTLE against each other all together!! That is right isn't it? Senior Iketani!! 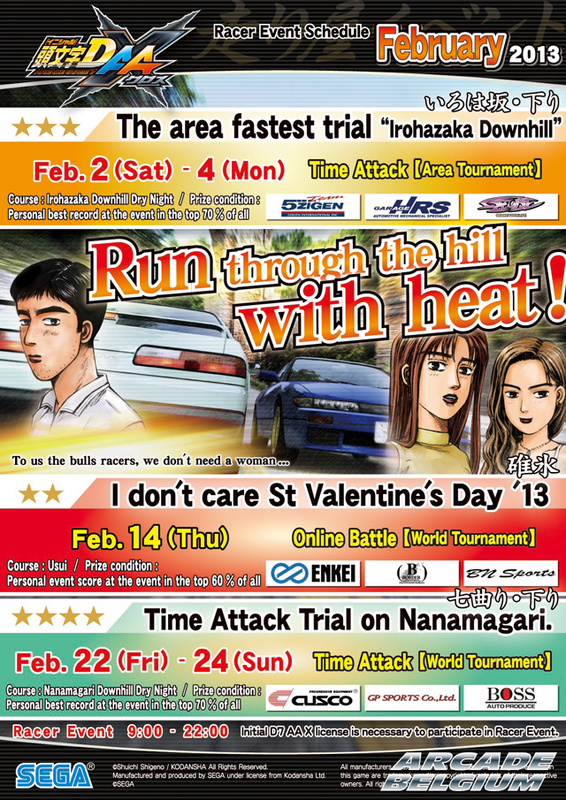 Time Attack Trial on Nanamagari. Held on the New Course "Nanamagari"! Who will be renowned for the name of great racer? Make a new legend!! Racer Event in March is decided! Holding the Event that nobody have experience! Holding Racer Event in super-senior course Tsukuba. Clear continuous corners by elegant shiftwork!! Nobody have experienced yet, the event is held on the left and right sides reverse course! ! The winner will be the guy who is a genius high adaptive capacity in battle situations! ! Racer Event in April is decided! Bet all to 1 chance! One Chance Challenge is held finally!! Holding the Racer Event on intermediate course "Myogi"!! The key points to the battle are continuous wide road hairpins and choice of driving line, the key! ! Tsuchisaka Snow course will be unlocked on Wednesday May 1st. Le parcours Tsuchisaka Snow sera débloqué le mercredi 1er mai. The 1st Time Release "Tsuchisaka-Snow" opens!! Snow" will be appeared from May, 1 (Wed)! It's a New Snow road subsequently Akina-Snow. Handle to drive the slippery road! Racer Event in May is decided! Holding the racer event of Tsuchisaka-Snow course open memorial! Get the fastest title Tsuchisaka-Snow! It is the title that could be given to a racer who conquers the course before anyone else! Who is the strongest & fastest in NISSAN cars!? The top is finally decided!! A long-awaited limited event for a car model is held!! Racer Event in June is decided! This time, it is "Versus"! Holding 2nd mirror event! "Mysterious experience of the horizontally reversed! It is a challenge to a difficulty course different from the usual!!" The area extremely fastest trial "Tsukuba Outbound"
Clear a continuous corners by elegant shiftwork!! "Who is the strongest & fastest in Honda cars!? The top is finally decided!! 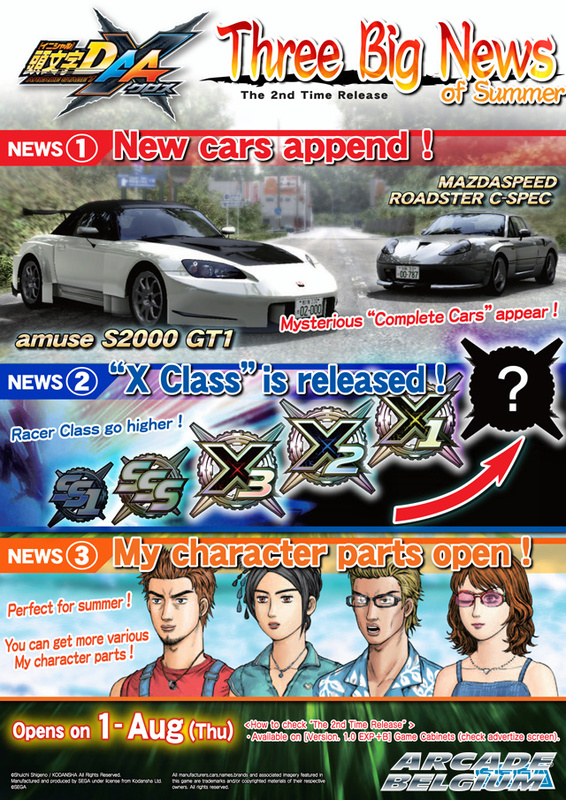 A long-awaited limited event for a car model is held!!" Racer Event in July is decided! The 7's Day is coming..! "This year's 7's Day is little bit different as always!? "Mirror event comes to Chapter 3 at last! The stage is Myogi! View is..
different from the usual...! A non-experience zone!" 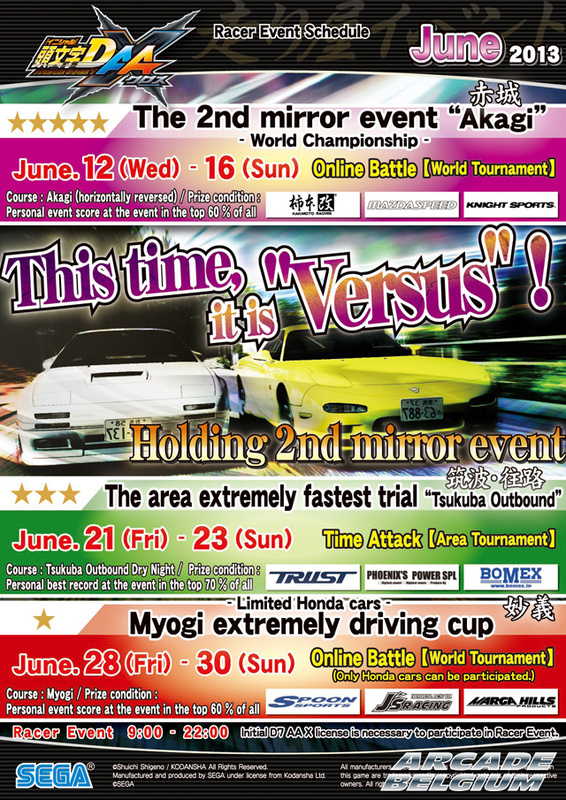 The area fastest trial "Usui Counter-Clockwise"
"Do time attack transcendence high-speed circuit course ""Usui"! Show your high-speed long drift to find the best line of your own!!" Racer Event in August is decided! Irohazaka is HOT in this summer! August 5 and 6 are the days of "Eight-Five" & "Eight-Six"!! Of course that new "86" and "TRUENO 2door" of the notchback is also a battle! "Stage of big events of the summer is Irohazaka! Get the title of ""Fastest & Strongest"", and become a champion of this summer!" "Holding the 2nd complete car event!! Who stands at the top of the monster cars!? " Racer Event in September is decided! 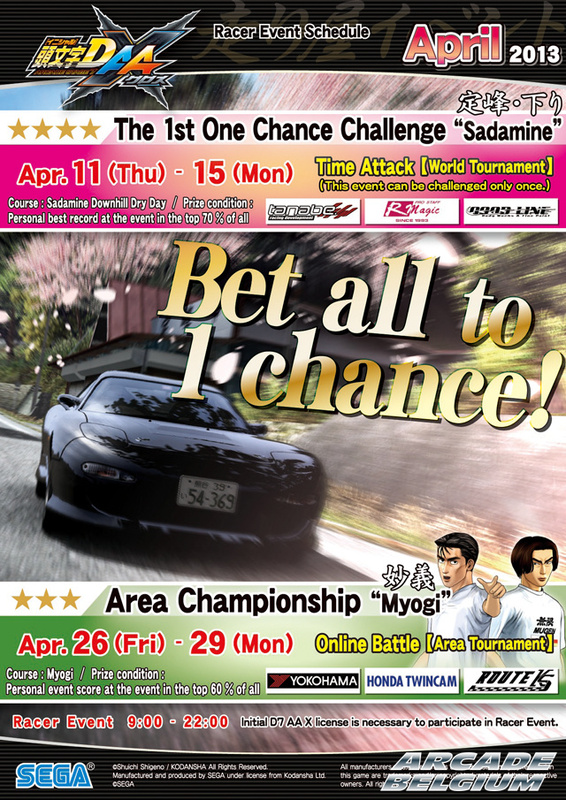 The 2nd One Chance Challenge "Tsukuba"
You can challenge only once!! Indispensable condition of ace driver is showing the best driving in one of the first!! Show us all of the techniques you have!! The World Extremely Fastest Trial "Nagao Downhill"
Holding Racer Event in super-senior course Nagao. 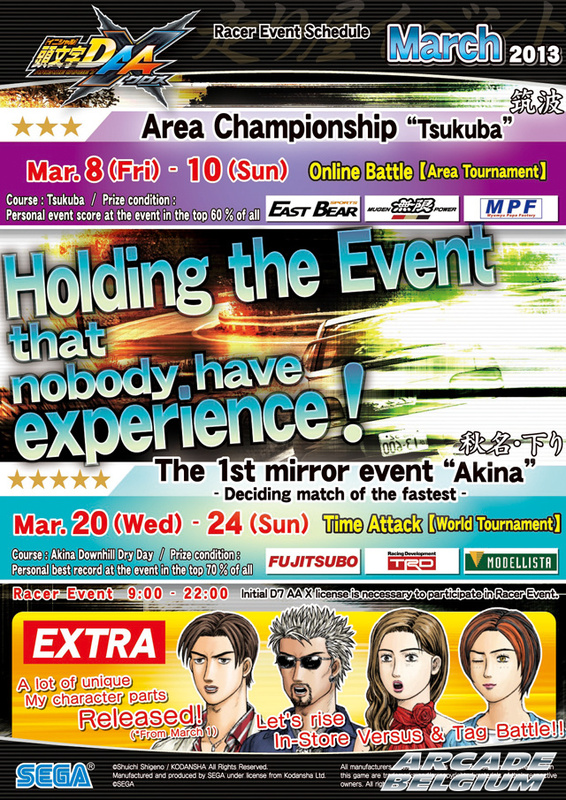 The Area Championship "Tsubaki Line"
One of the long courses of Initial D is the stage of this event! Can you drive in a concentrated until the end? Racer Event in October is decided! The 4th Mirror Event ! 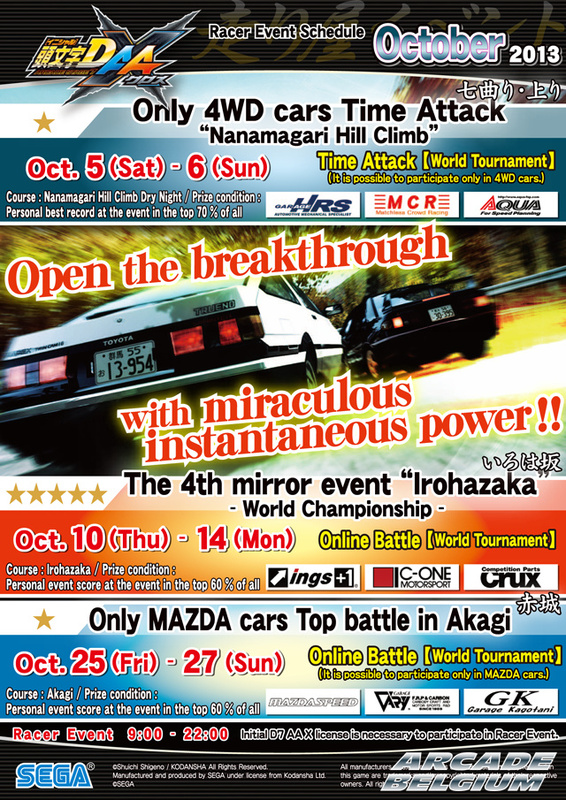 Only 4WD cars Time Attack "Nanamagari Hill Climb"
"This is not a car unless high power turbo plus 4WD!!" Which is the strongest 4WD!? Who is driving this!? Mirror event Chapter 4, To the sacred ground of Emperor! Drive thrugh the zigzag of inverted world with your fastest drift!! Who is the strongest and fastest in MAZDA cars!? The top is finally decided!! Tsukuba Snow course will be unlocked on Friday November 1st, 2013. La version enneigée du tracé de Tsukuba sera disponible à partir du vendredi 1er novembre 2013. The 3rd Time Release "Tsukuba-Snow" opens !! the snow course "Tsukuba-Snow" will open from November 1st (Fri) !! "Snow", "Night"...Racers do not choose the condition ! Fling up the air with powdery snow in Purple Mountain Tsukuba of the dark night... !! Racer Event in November is decided! Drive past the white darkness..! 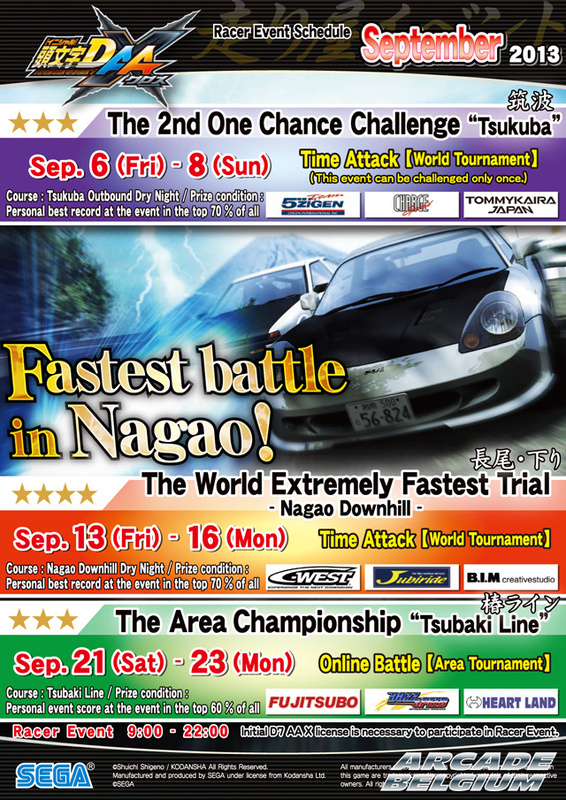 The Area Fastest Trial "Usui Clockwise"
Record time of Usui do not pass anyone ! that makes hot to the street ! 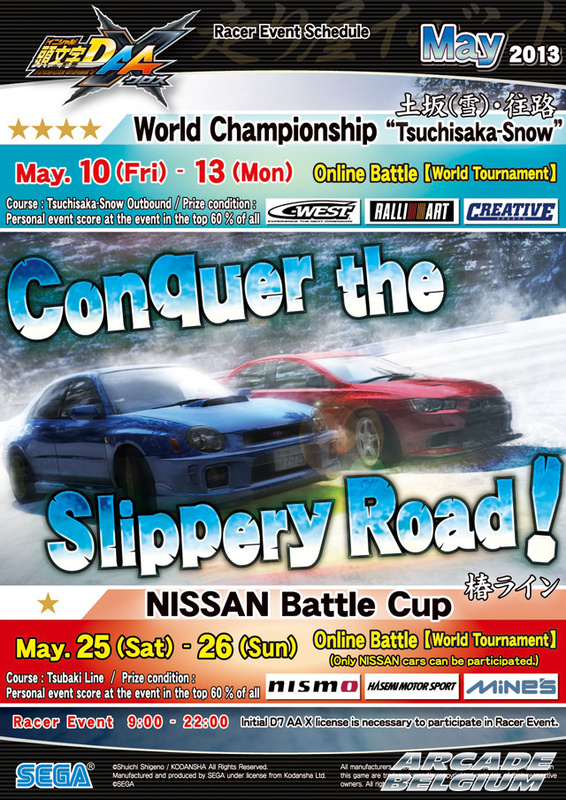 Racer Event of Tsukuba-Snow course open memorial is held ! and get the title "The real Tsukuba strongest" !